Directed by Dave McCary and screenplay by Kyle Mooney and Kevin Costello from a story by Mooney, Brigsby Bear is the story of a man who lived in an underground bunker learns that his favorite TV show was created by the man who captured him prompting him to see the outside world and finish the show’s narrative. It’s a film that plays into a man who embarks into the real world after being held captive for so many years as his ideas of reality and fantasy become confusing. Starring Kyle Mooney, Claire Danes, Greg Kinnear, Matt Walsh, Jane Adams, Michaela Watkins, Jorge Lendeborg Jr., Ryan Simpkins, and Mark Hamill. 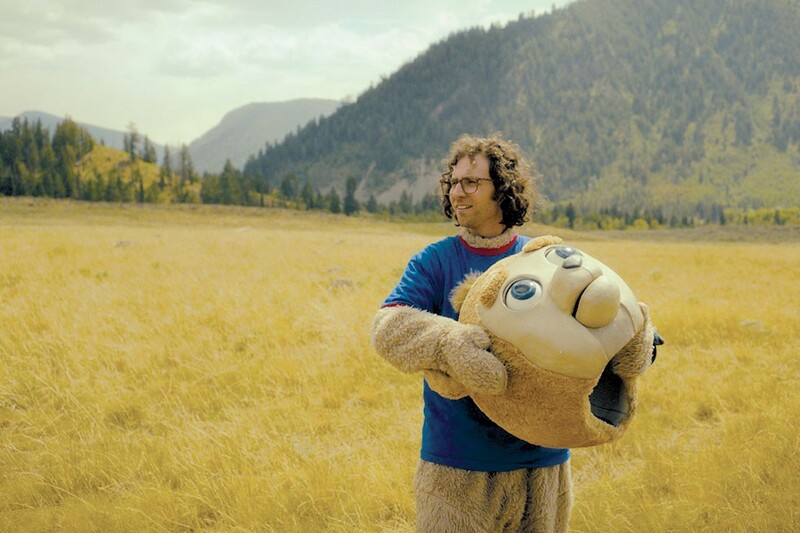 Brigsby Bear is a whimsical and heartfelt film from Dave McCary. A young man who obsessively watches a TV show while living in an underground bunker learns he had been abducted by a couple where he returns to his real family and eventually decides to finish the show that his fake father created into a film. It’s a film that has a man dealing with reality and what happened to him while realizing that a new tape of his show isn’t coming forcing him to make a project relating to that show. The film’s screenplay by Kyle Mooney and Kevin Costello focuses mainly on the character of James Pope (Kyle Mooney) who lives in an underground bunker as he obsesses over this educational TV show about a bear who saves the universe as well as teach children ideas and math problems of the world. For James, it’s the only contact to the outside world that he has while he also created an online fan forum about the show unaware that no one knows about the show’s existence. Upon his return to the real world and reunited with his real parents as well as learning he has a younger sister in Aubrey (Ryan Simpkins), James struggles with his new reality until Aubrey reluctantly takes him to a party where he manages to win a few people over through his discussion of his favorite show that it interests a few people. Even one of the detectives of his case in Detective Vogel (Greg Kinnear) takes interest in what James is doing as he wanted to fulfill a lifelong dream of acting as he used to act in plays before becoming a detective. With Aubrey eventually joining in, James finds a fulfillment in creating this film version of his favorite TV show with the props of the show that Detective Vogel retrieved from the station. Yet, James’ project makes his parents uneasy thinking he wouldn’t adapt to society following a stunt he pulled during filming where he took the blame for everyone. It would play into James’ need to focus on this project rather than adapt to a world he doesn’t know much about. Dave McCary’s direction is full of imagination and whimsy which play into this clash of reality and James’ need to create a reality that is based on the fantasy of the TV show that he loved. Shot on location in Utah, the film does play into a world where it starts off as this strange and offbeat sci-fi film where this family is living underground as if the world had been destroyed by a nuclear holocaust until the police arrive to arrest James’ captors. There are some wide shots of the locations in McCary’s direction yet he’s more focused on the interaction between characters and James’ enthusiasm for this TV show that he loved. Notably in the creation of James’ film where there is that element of amateurish, homemade filmmaking that is full of creativity thanks in part to a friend of Aubrey in Spencer (Jorge Lendeborg Jr.) who would create visual effects and be James’ closest collaborator in all aspects of the film. There are dramatic elements in the film as it relates to James’ parents desire to connect and bond with him as they bring in their family therapist Emily (Claire Danes) who suggest some things that she believes would help James. Still, McCary maintains a low-key approach to the drama in favor of something more light-hearted in its approach to humor as well as James’ journey about the world around him including those who participated in the TV show that his fake parents created. Even in what would become James’ vision for this film as he would do what he can to create something faithful to the TV show but also as a closing chapter in his life. Overall, McCary creates a touching and witty film about an abducted young man who seeks out to finish his captors’ TV special into a film. Cinematographer Christian Sprenger does excellent work with the film’s cinematography as it is largely straightforward with some grainy video footage for the TV show presentation as it was shot largely on video. Editor Jacob Craycroft does nice work with the editing as it is straightforward with some rhythmic cuts that play into the humor and drama. Production designer Brandon Tonner-Connolly, with set decorator Cynthia A. Neibaur and art director Andy Eklund, does amazing work with the look of some of the amateurish sets that James and Spencer created along with the props from the show. Costume designer Sarah Mae Burton does fantastic work with the clothes and costumes of the show including the homemade costumes that were created along with the casual look of the people in James’ life. The visual effects work of Andrew Sherman is brilliant for its approach to amateurish visual effects and usage of practical effects to create something as if it was homemade. Sound editor Leslie Shatz does superb work with the sound as it create some sound effects for the film along with some usage of naturalistic sound in various parts of the film. The film’s music by David Wingo is wonderful for its usage of ambient and electronic pieces to play up the feel of the 1980s as if the TV show was created in the 1980s while music supervisor Kier Lehman provides a mixture of music for its soundtrack that includes acts like YACHT, Kyle, DecadeZ, Vessel, Join the Riot, and Nate Heller. The casting by Courtney Bright and Nicole Daniels is great as it feature some notable small roles and appearances from Andy Samberg as mental hospital patient James befriends late in the film, Tim Heidecker as an actor in a movie James sees with his dad, Kate Lyn Sheil as an actress who appeared on the TV show as an object of affection for James, Alexa Demie and Chance Crimin in their respective roles as a couple of Aubrey’s friends in Merideth and Logan, Beck Bennett as a detective in Deputy Banner who becomes suspicious about James’ activities, and Claire Dane in a terrific small role as the Pope’s family psychiatrist Emily who is trying to understand James only to make suggestions that proved to be not helpful to his well-being. Jorge Lendeborg Jr. is superb as Aubrey’s friend Spencer who becomes fascinated by the TV show that James tells him about where he would upload episodes to YouTube and become James’ key collaborator in the film. Matt Walsh and Michaela Watkins are fantastic as James’ real parents in their respective roles as Greg and Louise Pope who are trying to re-establish their relationship with their son while being confused by his obsession for the show while Ryan Simpkins is wonderful as James’ younger teenage sister who initially doesn’t want to do much with him only to become a collaborator for his film where they start to bond. Mark Hamill and Jane Adams are excellent as James’ captors in their respective roles as Ted and April Mitchum with Hamill as the creator of this TV show who has also been James’ protector with April as the maternal figure where the two try to protect James from the ugliness of the world. Greg Kinnear is brilliant as Detective Vogel as the man who brings James back home while becomes interested in what James is doing prompting him to return to his love for acting by taking part in the film. Finally, there’s Kyle Mooney in an amazing performance as James Pope as an abducted young man who is a big fan of a TV show he believed everyone knows only to learn he was abducted yet is more concerned about the next episode forcing him to create his own film where it’s a charming and heartfelt performance of a man whose innocence is his key to living. Brigsby Bear is a sensational film from Dave McCary. Along with its ensemble cast, touching script, dazzling visual effects, and old-school approach to amateurish filmmaking. It’s a comedy-drama that touches all of the right places while not being afraid in expressing sentimentality in a young man wanting to finish the creation that his abductors had created. In the end, Brigsby Bear is a phenomenal film from Dave McCary. I've had this in my Netflix queue for a long time and it's finally inching it's way towards the top, so I'll hopefully be seeing it soon. I hope I like it as much as you. I saw this one at some weird festival and it was a fun surprise. @Brittani-It's a film with a lot of heart and whimsy. If you're into that kind of stuff, you'll enjoy it as it's just a charming and fun film. @Jay-It was full of surprises. I enjoyed it.